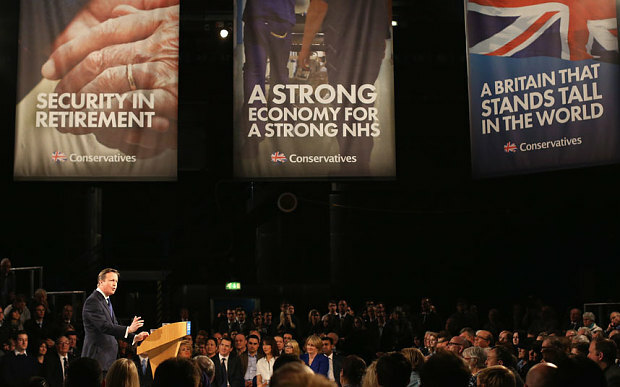 “A Strong Economy For A Strong NHS” proclaims the large banner hanging above the Manchester venue where the Conservative Party is gathering for their pre-election spring conference. And right there, in letters six feet high, the Tories finally admitted that they have no real vision for Britain, that they are ashamed of what ideology they have left, and that they are determined to fight the 2015 general election timidly, and on Labour’s terms. A Strong Economy For A Strong NHS. Have the Tories forgotten the manifold other reasons for wanting a strong economy – rising living standards, more consumer choice, powerful new innovations, material progress, a more secure and influential country? Better public services can certainly be a symptom of a strong economy, a positive indicator that things are going well. But that is not what David Cameron’s Conservative Party is saying. The Tories are openly – even proudly – suggesting that the whole purpose of a strong economy, the very reason we should bother to get up in the morning, is to earn money to give to the government in taxes so that we can have public services like the NHS delivered back to us. According to this poisonous mindset, we should not strive for the sake of our selves, our families, our friends and neighbours, for the satisfaction of a job well done or to leave the world a better place for the next generation. That would be tawdry. No, Britain should limit its national time horizon, our vested interest in the future, to the lifespan of its most selfish citizens, those who believe they are being progressive and compassionate by building a country that serves its own public services rather than the other way around. The banner proclaims, in bold capital letters, that the Tories have lost their way under the leadership of David Cameron and George Osborne, and that a majority of the Conservative party is now firmly committed to fighting the 2015 general election on Labour Party terms and traditionally Labour issues. And in these circumstances, is it any wonder that support for the two main parties is bleeding away, and that long-standing party members and activists are either losing interest or letting their frustration bubble over in public? David Cameron has been heckled by a long-serving Tory member angered at the Government’s failure to curb migration at the launch of the party’s election launch. In a rare breach of the slick presentation that characterises Conservative events, Mr Cameron was heckled by a party member of 35 years who was angered by the scant mention of Europe and immigration in the speech. Mike Howson, 59, from Staffordshire Morelands, shouted that Mr Cameron had “betrayed the country” by failing to cut immigration. He voted Ukip at the last election. But it is not just the aloof party leadership who are guilty of coalescing around a remarkable political consensus that is simply not shared by the majority of the country. Many of the remaining Conservative Party faithful are also so desperate to see Team Blue remain in power that they are willing to excuse almost any ideological compromise or policy betrayal by the leadership if it will keep the keys to Number 10 Downing Street in the right hands. Why are you even here? Maybe the heckler went to Manchester to cry out for a Conservative party that believes in something more than simply wielding power, and trying to prevent Ed Miliband from acquiring it. Do you want Miliband to win? I’m sure the heckler does not, but after so many compromises and concessions to the left, the pro-European status quo and the worship of the NHS, at what point does it essentially cease to matter whether Ed Miliband or David Cameron occupies Number 10 Downing Street? 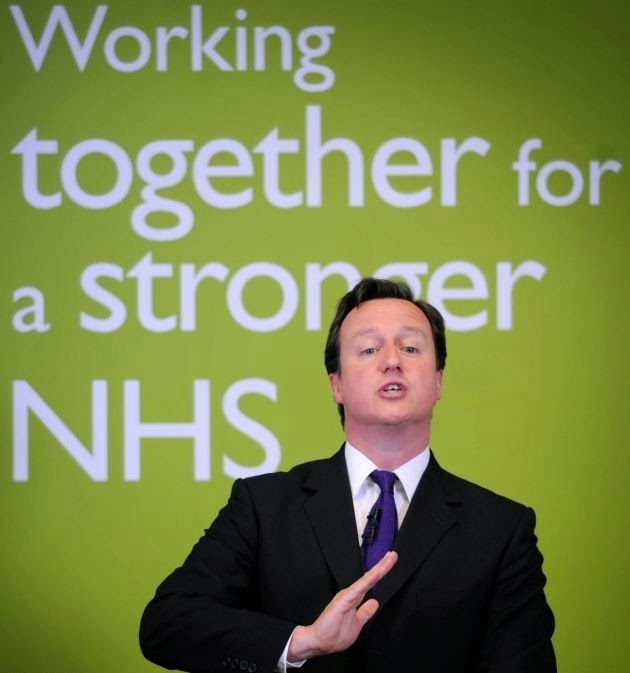 Even if campaigning for “A Strong Economy For A Strong NHS” was not a complete rejection of everything that conservatism stands for and can offer the country, it would still be a catastrophically stupid idea, because there is simply no advantage to be gained from engaging the Labour Party on the NHS. The Labour Party invented the NHS, back in 1948. We all know this because they never shut up about it, and have worked ceaselessly in the intervening decades to turn it from an important public service into a uniquely British cult with its own local temples (save our A&E!) and mythological personalities (like Saint Aneurin Bevan of Tredegar). And the Conservative Party think they can compete with that? The Conservative Party needs to let go of the unnecessary shame and embarrassment at their own beliefs and policies. Small government doesn’t mean cruelty, heartlessness or a lack of compassion for one’s fellow citizens – in fact, countless examples show that few organisations are capable of cruelty, abuse and neglect of a scale and severity as often achieved by the oversized British state. New leadership from the Conservative Party needs to acknowledge this, and dare to say so in public. Reducing the size of the state (yes, even to levels “not seen since the 1930s“) can actually empower individuals and communities, done properly. Pushing responsibility and accountability away from central government can be a force for good and an instrument of positive change, as can setting our national ambitions slightly higher than hoping for decent public services. But anything would be preferable to the option currently before us as we approach Election 2015: a tepid serving of Coke Zero Conservatism, masquerading as Diet Labour.